Has Zimbabwe gone coup coup? Judging by the photos and videos doing the rounds on social media, we may be experiencing a military coup. There are pictures of tanks and armoured vehicles heading into Harare. This follows the last week’s firing of Vice President Mnangagwa and a statement yesterday by General Chiwenga, the head of the armed forces which support Mnangagwa as opposed to Grace Mugabe wife of the President and his clear to choice to succeed. See below. It may be too early to draw conclusions, but we are fulfilling the Chinese curse. The DM has no doubts! I’ve read some of the reports and watched a small item on our TV – not always that well informed. As I read it the military are trying to down-play the idea of a ‘coup’ – but are, nonetheless, in the middle of doing just that. From my perspective, Mugabe has been a disaster for all the peoples of Rhodesia / Zimbabwe. He should never have been allowed to accrue so much power – but he has. It has to be time to ensure that he is not permitted to ‘will’ his position to another member of his family. It seems to have proceeded fairly smoothly. From what I gather, several of Grace’s cabal, including ministers have been arrested. Mugabe is under house arrest. Two security guards have allegedly been shot. Other than that the only effect appears to be some closed roads around parliament and the CBD. Most people have been at work all day. Generally speaking we are all pretty optimistic, but it is still early days. Everybody seems to want democracy, but I am not convinced that is the right way forward for this continent. As with other parts of the world, the politicians will appeal to the lowest common denominator and in this part of the world, that is quite low and quite substantial. Thus it was that RM was able to stay in power so long and Zuma and the ANC still govern South Africa. Had Mugabe given up any pretence of democracy from the outset, he might have done a better job. Sipu, I trust that the Zimbabwe Supreme Court has managed to freeze all bank accounts or investments made by Gucci Grace and her unpleasant children. The people of Zimbabwe need this money which belongs to the country. 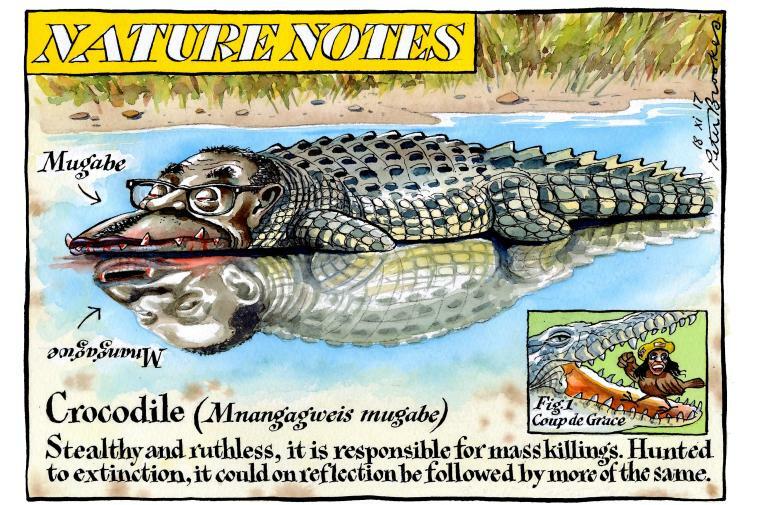 Janus, Mnangwagwa’s nickname is Ngwenya, which means crocodile. He is a quiet, patient killer. His political faction within ZANU PF is known as Lacoste because of the brand’s logo. Most people here are very aware that those seeking to overthrow Mugabe are every bit as wicked as he is, but, the people are so desperate for change that they will support them. There is hope that some form of rule of law will return to this country. A few obvious changes will make the world of difference and investment will pour int. Abandon the Indigenisation Policy for businesses and investment. Compensate farmers for the farms that were stolen – Apart from being a matter of justice,this will release the title deeds. See next point. Allow people including ‘new farmers’ and returning whites, transferable title to farm land, ideally free-hold, but worst case scenario 99 year lease. Rapprochement with the West, especially, the UK and US. Encourage tourism by eliminating expensive visa requirements. Allow for internationally monitored elections. Above all, stop corruption with in government ministries. This country is very rich in terms of natural resources, including minerals, agriculture and tourism. It has a stunning climate with good rain fall. I have no doubt that with good governance it could rise to be the wealthiest (per capita) in Africa within 10 years. Sheona, it is difficult to know what they will do about Grace. They hate her but Zimbabweans are fickle and ‘move on’ very quickly. She could end up be being dragged through the streets or they may allow her to depart to Malaysia with her millions. But the country will be well rid of her, her husband and her children. That they go, is enough. But should she be allowed to take “her” millions with her to Malaysia or wherever? Sheona, the betting is she sent it there in good time. Hi Sheona, Janus is right, in that if she has millions, and I am confident she does, they are already off shore and she may be allowed to keep them if she is given free passage. However, if they are traceable authorities may seek to freeze them. Whether that happens or not will depend on the deal that is struck and the level of vengeance demanded by the people of Zim. My own feeling is that they will let her keep her off shore assets but will confiscate her farms and houses held in this country. And so it has come to pass. Prominent in this morning’s news was the announcement that Mugabe has resigned “with immediate effect.” Any ideas where he’ll go to live once he’s (prudently) left Zimbabwe? Sipu: I do think you’re right about anyone who now takes power being just as bad as now-former-President Mugabe, even if in some marginally different ways. Also about most people not caring just so long as there’s some sort of change, as though things could hardly be worse. Loved your “coup coup” headline! Thanks Cog. The fat lady seems to be giving it a bit of wellie. Sipu, is the Great Dictator being allowed to retire gracefully – or wha’? According to the papers here – Mugabe is being given immunity from prosecution. Not too much problem with that – how much longer can he live – but surely not with all his ill-gotten gains. He will be able to remain in Zimbabwe – and the question of Grace does not yet seem to have been resolved, although the article hinted that she would also be allowed to remain: free and not prosecuted. Frankly, if she has an ounce of Common Sense (which seems unlikely in view of the way she believed in her unassailable power) she should get out PDQ and put her ill-gotten wealth into some very deep and untraceable place, under a new name – and vanish. Hi Janus, this is as much as I know.